I saw your film "THE LAST SAMURAI". I'm truly grateful to have encountered your wonderful film, which awakened the true spirit of the Japanese sleeping within myself. 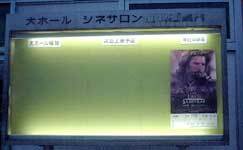 I saw "THE LAST SAMURAI" in a small movie theater in my hometown - Yubari. But, to my deep regret, the movie theater (named CINESALON) stopped operations on March 31st. "THE LAST SAMURAI" was THE LAST FILM shown at this small theater. What a coincidence ! You may recognize my town for the Yubari International Fantastic Film Festival held every year. I think that a "film festival town" without a theater is a pity. One of the reasons the theater closed down is that the sound system was broken. The sound system is so expensive that even a second-hand system (available because several theaters in neighbor towns have also closed down) costs as much as the annual budget allocated for the small theater. But we are all not sitting around and lamenting the loss. Dedicated people are getting together to keep the torch of cinema burning. Volunteers endeaver to show a film once a month. With them, I will do what I can to support this small movie theater so that I can see your film there again. Mr. Cruise, I hope you will continue to take an active part in the film industry. Please make many more great films. I am looking forward to seeing them.